The tour guide gave us an action item of sorts as we traveled back to Skagway after visiting the toe of the Davidson Glacier. “Get out into the wilderness more often, even if it is your backyard,” she explained that our backyard is a wilderness because it is “wilder” than the indoors. I guess she is correct; although, I have been in backyards of some condominiums that have been nothing but concrete and fences. Personally, I have always been a concrete kind of guy, perhaps that is why I always liked the idea of condos. Even growing up around dirt bikes, dune buggies, campers, boats, and fishing, I have always been the kid that wanted to stay home. 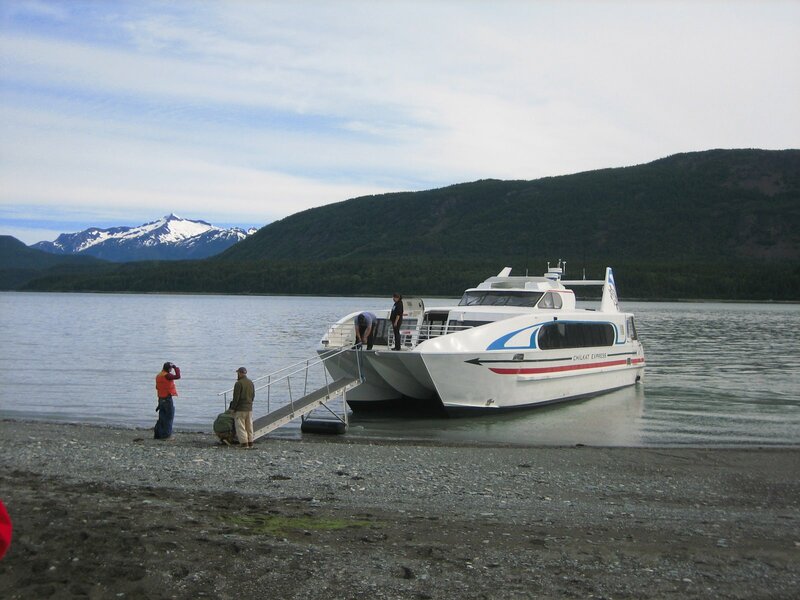 The excursions I took while on my Alaskan cruise didn’t seem too tough; I was well cared for by tour guides, and I returned to a nice comfy cruise liner at each day’s end. Besides, this was during the relatively warm months in the great Northwest. I wasn’t walking on a glacier in the freezing blackness of the Alaskan winter. With that said, here’s a very brief travel log of my vacation complete with images. I won’t bore you with the onboard details. Not to say that the time onboard was boring, it’s just that, unless something like a murder or a diamond heist occurred while at sea, I don’t see much point in telling you how well I was fed and how much reading I did with a breathtaking view of Alaskan/Canadian coast just over my shoulder. While in Juneau, I hiked on the famous ice field. 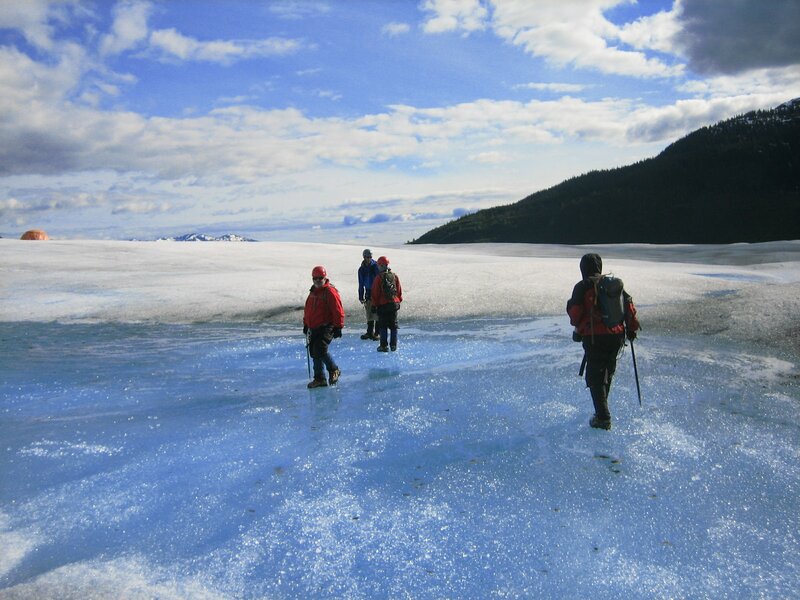 The Juneau Icefield covers nearly 2,500 miles and includes over 20 glaciers. 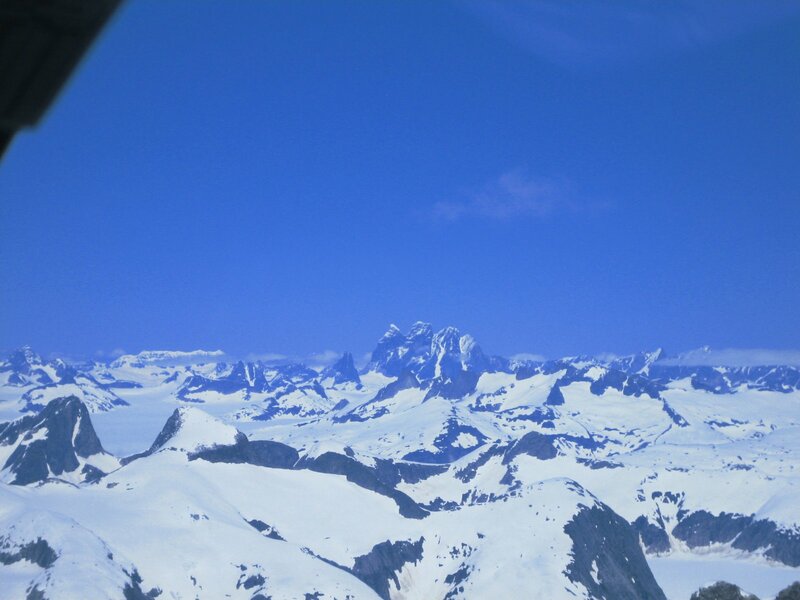 I was so in awe of the spectacle while flying in a helicopter over portions of icefield that I forgot to ask the pilot which specific glacier we would be hiking on; however, referring to the icefield map afterwards, it appeared as though our group hiked on the Mendenhall Glacier. After donning gloves and helmets to our already fitted boots, pants, and jackets, the tour guides helped fasten crampons and harnesses and gave us each an ice ax and a backpack. For three hours, we trekked along the icefield viewing stunning blue ice where the snow had accumulated and had compacted the underlying snow layers from previous years into solid ice, causing changes in volume, density, and crystal structure. The ice appears blue because it absorbs all colors of the visible light spectrum, except blue, which it transmits. Perhaps the most magnificent component of the glacier was the icefalls, created when the glacier would move downhill on a steep slope. These icefalls are literally hanging glaciers, fa lling slowly over time by the force of gravity. 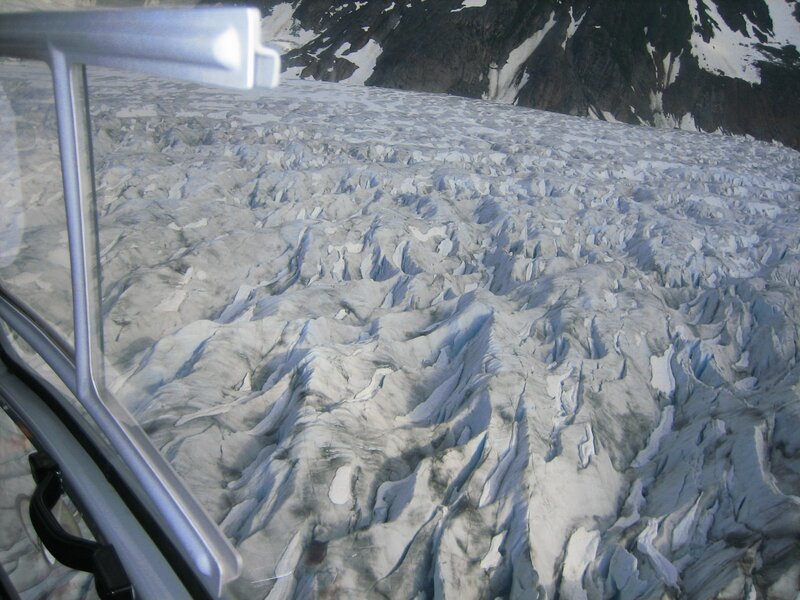 As the glacier advances down the mountainside and into valley, it breaks apart and accumulates into massive piles of melting and solid ice with huge gaps separating ice blocks the size of houses. The ice blocks then continue to tilt and twist under the weight of the ice above them. Occasionally, we would have to jump over a crack in the glacier only about 18 inches wide, but over 100 feet deep. We could hear a waterfall deep under the surface. When we reached the point where the water dropped off into the narrow gorge, we dumped our bottled water and filled our bottles with the real thing—glacier water. It tasted far better than anything I have ever drank. We would occasionally walk on what looked like water, where organic material, such as leaves blown in from the nearest mountainside, had landed, and their energy would melt the ice only to have it freeze over, creating a bright clear-blue frozen pond. 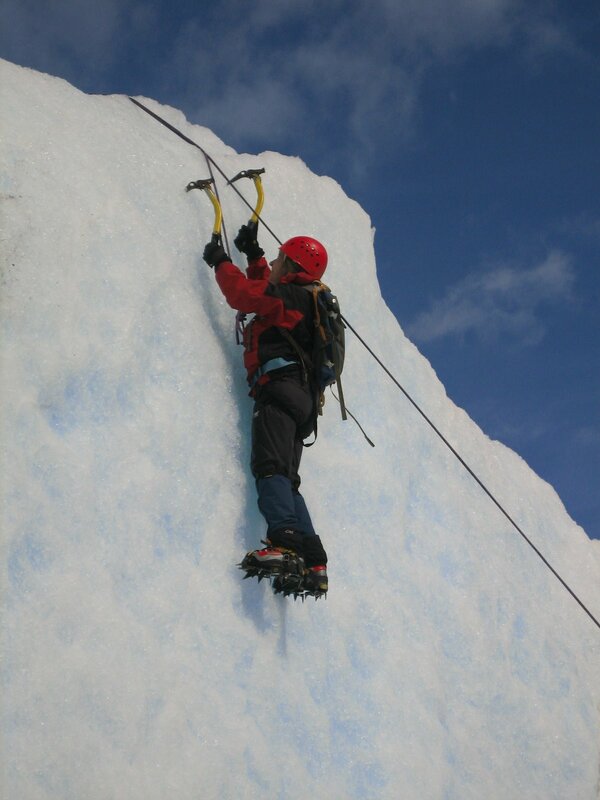 We all led with our ice axes testing the ice to ensure it was not water; it was that clear. When we crossed the clear-blue ice pond, I could see the base camp tents and knew our excursion was about over. I would be lying if I said that the rest of the cruise and the excursions were anticlimactic, but without a doubt, the best part of the vacation was at an end. 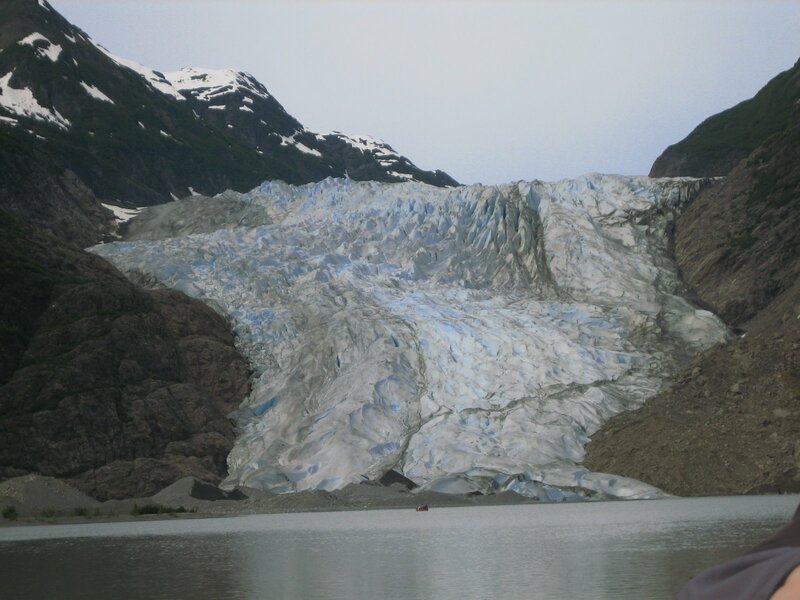 June 30, Skagway: The Davidson Glacier In Skagway, we took a ride on a 3200 horsepower catamaran to a secluded area near the toe of the Davidson Glacier called Glacier Point. On the beach where the catamaran dropped us off, the mosquitoes were so thick a person could hit at least two with a single swat. We hiked through a rain forest where the guides assured us that, while this was Grizzly country, the trees were too close together for bears to hunt. Still, I regarded the narrow trees to see if I could climb any of them if one of the behemoths was too hungry to care about the tight fit forest or happened to discover our eight-foot-wide trail. In the center of the forest, we found our guides’ Spartan living quarters. Before using the outhouse, the guide implored us to put our used toilet paper in a box adjacent to, but not directly in, the waste pit. The guides said they dig out the pit every two weeks and add the fortnight’s produce to a nearby compost pile; if there is any toilet paper in the pile, they have to remove it by hand. On the outhouse deck were a half-dozen bottles of mosquito repellent. After dousing ourselves with the spray, we took a short hike to canoes where we paddled to the glacier. One thing that fascinated me about the guides was that the mosquitoes were not attacking them. Additionally, they did their presentations without a single swat at the bugs—as if the bloodsuckers flying around their head were not there. The glacier would have seemed awesome had I not be hiking on the Juneau Icefield a couple days previous. Still, when the guide explained why we couldn’t get any closer than about 100 feet from the ice, I was impressed. He told us that if the glacier corked (i.e., if the bottom of the glacier, underwater, broke off and shot to the surface), the displacement of water would be so great that we might be knocked over or hit by the giant wave. This explained the outboard motors on all the canoes. We did see a part of the glacier calve. Actually, everyone in the canoe, except me, saw the giant piece of ice break loose from the glacier and splash into the fjord; all I heard was the violent CRACK and when I turned around, I only saw the big splash and heard everyone saying, “Wow, did you see that!” It’s ironic that years ago I began what ultimately turned out to be a ten-year harping to my wife about going on an Alaskan cruise on the prospect of seeing a glacier calve. I missed my only chance. July 2, Prince Rupert, B.C. 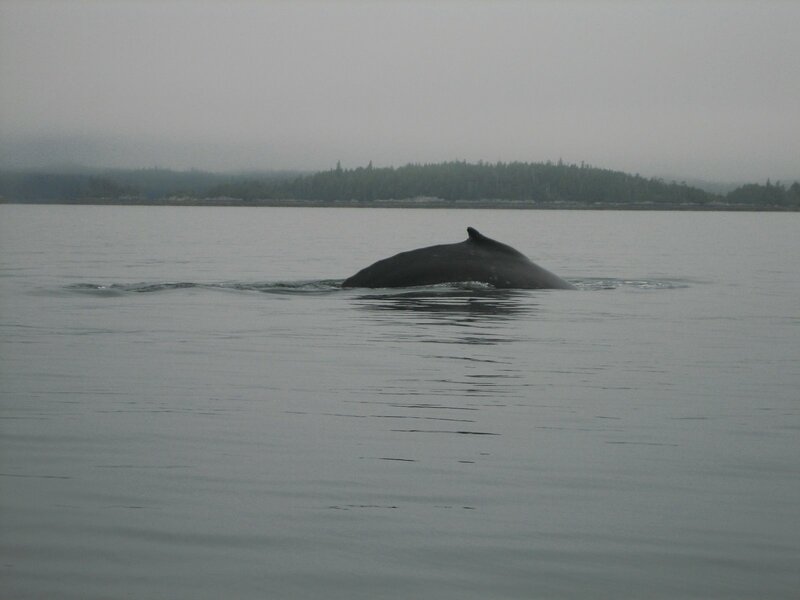 : Whale Watching I saw a Humpback Whale in the waters off Prince Rupert, British Columbia. It is amazing to get so close to one. Now I know why all the people fresh from Alaskan cruises either talk about their experience seeing one up close or whine about not seeing any at all; it’s a stirring experience. Since we missed the season when most Humpbacks are in the area, the guide played down the whale-watching portion of the trip and talked about the seals we were heading out to visit. When the Humpback surfaced, we chased it for a while until its tail fin appeared, signifying it was going down for a long dive. We caught up with it sometime later; however, it did a long dive again, and we headed back to the dock. Before we took our Zodiac craft out to try to track down these gentle giants of the sea, our guide drove us only a few yards from where the craft was moored to point out Bald Eagles in flocks as thick as seagulls. The majestic birds have grown lazy, roosting near a dock. They now wait for the fishing boats to come back to scrounge for food. This was not the habitat I imagined the iconic American bird to have. Perhaps they are just lazy in Canada. The sad thing about the excursion was that it was, minus a trip to an old cannery later that day, the last one on the trip. The next two days we were at sea, much of that time was spent eating, reading, and packing. Even in fifty-degree weather, I was beginning to feel the heat of Sacramento. Four days later, back at work, I just stared at my LCD’s wallpaper, an image of the giant Mendenhall Glacier, fondling a small wooden box I bought in Skagway, supposedly made by natives; it’s the only thing I can touch that came from the place. I feel a little like Peter Riegert’s character in Local Hero—an outsider who falls in love with a foreign land and its rugged beauty but has to return to his lonely office. I’m now at home playing fetch with our dog in triple-digit weather. I’m in my backyard—the “wilder-ness” and am amazed that I can’t see clearly from one side of my yard to the other; the heat and the smoke from all the Northern California fires have made me long for Alaska. Even the ruggedness of Glacier Point would be a welcome substitute—at least you can swat mosquitoes, you can’t swat smoke.